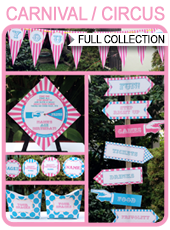 Instantly download this Carnival Bunting / Carnival Party Banner template. Easily decorate your Circus or Carnival Party by printing out the “Happy Birthday!” bunting immediately. 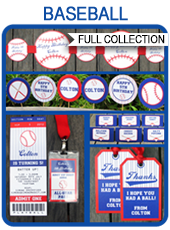 1 x page of EDITABLE Banner Pennants so you can print off your own custom message. There are two triangular Banner Pennants per page, each measuring 4.8 inches wide x 9.5 inches high. 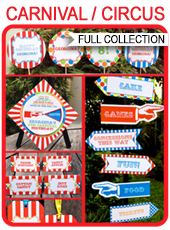 Download your Carnival Party Banner template immediately after your payment has been processed. Trim out each Carnival Party Banner pennant on the provided cut lines, punch a hole in each top corner and thread a ribbon through to tie banner up. Each triangular Banner pennant is sized 4.8 inches wide x 9.5 inches high. There are 2 pennants on each page.